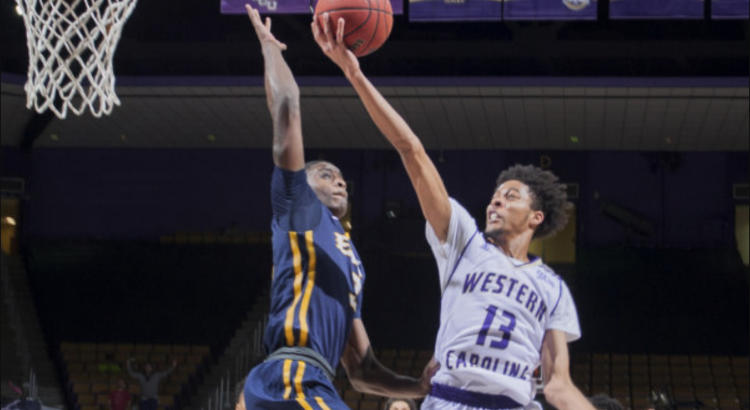 On Saturday, January 26th, ETSU will travel to Western Carolina (5-16, 2-6 in the SoCon) who is ranked #294 by KenPom. Even though the Catamounts have only won 5 games so far they appear to be much improved over last year. They took Furman to double overtime on the road, played UNCG better than ETSU did, going down to the wire before losing by 9. They beat Samford more handily than the Bucs (or than Wofford did), 76-69. They came within 3 of #113 Charleston, 74-77, within 5 of Southern Miss, 63-68 and within 7 at Wake Forest 64-71. They also lost at VMI (83-91), at Mercer (80-84), and at home to Chattanooga (62-73). Ask UNCG or Furman if these guys are a serious threat. They play an 8 man rotation with only 1 senior (Marc Gosselin) and 3 freshmen (Gibson, Myers and Cottrell). They play a deliberate tempo, scoring only 70.0 a game. They defend the 3 well, allowing a best in SoCon .316. But they are vulnerable inside, allowing 57.2% from 2, 343rd in D1. Blocks (1.6 to 4.1 for ETSU) and steals (4.5 to 7.5 for ETSU) are low. 6-7 265 JUCO Jr. Carlos Dotson is a nimble-footed bull inside, with 9.7 rebounds and 13.3 ppg, but not a good defender, and makes a lot of turnovers (3.4). Turnover margin is a terrible -8.43, worst in SoCon by a mile (3rd worst is ETSU with -0.75). In fact, worst in D1! Assists are a weak 12.4 per game, 267th in D1. Three point shooting is similar to ETSU: .358 to .356, 8.9 makes to 8.3 makes. Free throw percentage is even worse: worst in SoCon .629 to a second worst in SoCon .670 for the Bucs. But they rebound well – 3rd best in SoCon +4.7 margin, 59th in D1. ETSU is now at +13.1. Both teams had Thursday off. We’re hoping to see the Bucs take a step forward from their last couple outings and get rid of the sour taste from the UNCG game. A weak effort will leave us struggling to eke out a win like UNCG and Furman did against these guys. Kenpom favors the Bucs by 10, 74-64.